Vancouver, B.C. December 3, 2018— Ascot Resources Ltd (TSX.V: AOT; OTCQX: AOTVF) ("Ascot" or the "Company") is pleased to announce an updated resource estimate for its flagship Premier Project (including the formerly separate Premier, Dilworth and Silver Coin properties) in British Columbia's Golden Triangle. 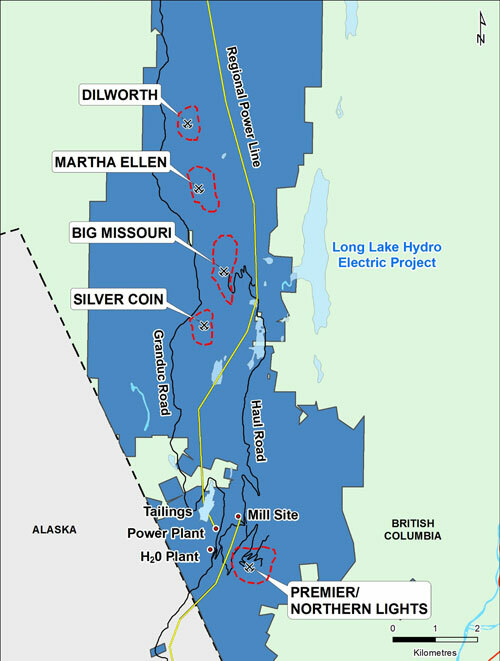 The resource includes high-grade zones from the Premier and Northern Lights, Big Missouri (including North Star, Province and Unicorn), Martha Ellen, Dilworth and Silver Coin areas (see Figure 1). The outlines of these zones were modeled with a potential high-grade underground scenario in mind. Derek White, President and CEO of Ascot Resources commented, "Management worked hard to develop a series of resources in 2018 and I am very pleased to announce a significant increase to our high-grade resources during the year. This is an outstanding achievement for the company in a very short time frame. These results combined with our efforts to identify new targets for exploration utilizing Induced Polarization geophysics and improved gold recoveries from metallurgical test work, provide for a very optimistic outlook for Ascot. We will continue to focus on developing our engineering studies around three spatially separate potential mining areas diversifying the production risk. Our principal business objective is to maximize the utilization of the existing infrastructure, specifically with regard to the mill throughput and I remain very optimistic about Ascot's future success." In August of 2018, the Company engaged Mr. David Rennie, P.Eng. of RPA Inc ("RPA"), Ms. Sue Bird, P.Eng. of Moose Mountain Technical Services ("Moose Mountain") and Mr. Sean Butler, P.Geo. to prepare an updated Mineral Resource estimate for the Premier Project. Mr. Rennie is responsible for the resource estimate of the Premier/Northern Lights zones while Ms. Bird is responsible for the Big Missouri, Silver Coin, Martha Ellen and Dilworth areas, with contributions from Mr Butler in the Silver Coin area. Mineral Resources are estimated at a cut-off grade of 3.5g/t AuEq. Mineral Resources are estimated using long-term metal prices of US$1,350/oz Au and US$20/oz Ag. For Premier/Northern Lights, an average bulk density of 2.84 t/m3 was used. For all other zones, the average bulk density was 2.80 t/m3. For Premier/Northern Lights, the zones were interpreted using a minimum true with of 2.5 m for steep dipping zones and 3.0 m for moderate to flat dipping zones. For all other zones, a minimum true width of 2.5 m was used. Figure 1: Map of Ascot's Premier Project showing the relative location of the various resource areas described in this release and the existing infrastructure in the area. In accordance with National Instrument 43-101 – Standards of Disclosure for Mineral Projects ("NI 43-101"), an updated technical report for the Premier Project will be filed on SEDAR and the Company's web site within 45 calendar days of this disclosure. To participate, please dial: Canada/USA toll-free 1-800-319-4610 or International toll +1-604-638-5340 and request join to the "Ascot Resources Conference Call". Participants please dial in 5 to 10 minutes prior to the scheduled start time. A presentation will be posted on Ascot's website www.ascotgold.com under Investors/Presentations before the start of the call. Each of David Rennie, P. Eng. of RPA, Sue Bird, P. Eng. of Moose Mountain Technical Services and Sean Butler, P. Geo. is an independent "qualified person" (as defined in NI 43-101) responsible for this mineral resource estimate. RPA and Moose Mountain, and Mr. Butler have conducted independent data verification relating to drill hole location and orientation, sampling methodology, assay QA/QC and database integrity and found the results satisfactory. RPA, Moose Mountain, and Mr. Butler acknowledge that they have reviewed the technical content presented in this news release and approved the written disclosure.